The abdominal organs, in general, lack the relatively well-protected environment afforded the thoracic organs by the rib cage. Trauma to the abdomen may be caused by penetrating objects or blunt impact, and can be life threatening by any measure (American Association for Automotive Medicine, 1980; Borlase et al., 1990; Croce et al., 1991; Moore et al., 1989; Kumar et al., 1989). While trauma from penetrating objects is typically apparent,. that from blunt impact initially may lack symptoms, leading to delayed diagnosis, with resultant high morbidity and mortality (Harris et al., 1991). 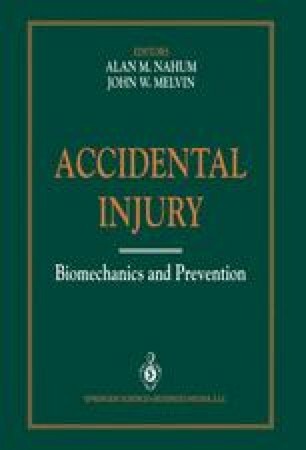 This chapter will deal exclusively with blunt trauma such as that experienced by motor vehicle occupants in automotive collisions.